Funerals are being held today for Morgan Barnard ,17, Lauren Bullock, 17, and Connor Currie, 16. School children formed a solemn guard of honour in tribute to a young victim of the St Patrick's Day party crush as a day of funerals began. 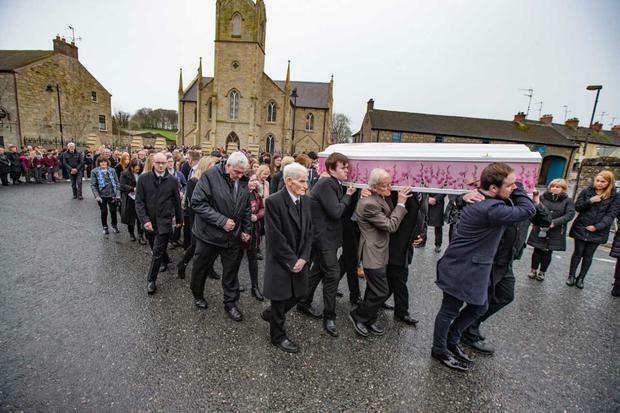 Hundreds attended St Patrick's Church in Dungannon, Co Tyrone, to say farewell to 17-year-old Morgan Barnard, who died in the tragedy outside a hotel disco in nearby Cookstown on Sunday. The leader of the Catholic Church in Ireland, Archbishop Eamon Martin, addressed mourners as Morgan's requiem mass began. "And only faith can dare to speak into the darkness of these days to offer a glimmer of light and hope in this valley of tears. "Here in Co Tyrone this week - as families, parishes, schools and communities - we've been circling each other around with love and faith and kindness and compassion. "Thank-you all for being here today to offer your prayerful presence and support. "In the days ahead, we will cherish the memories of these precious and gifted young people whose lives have been so suddenly wrenched from among us; we will continue to hold their families, and each other, close in love and faith." 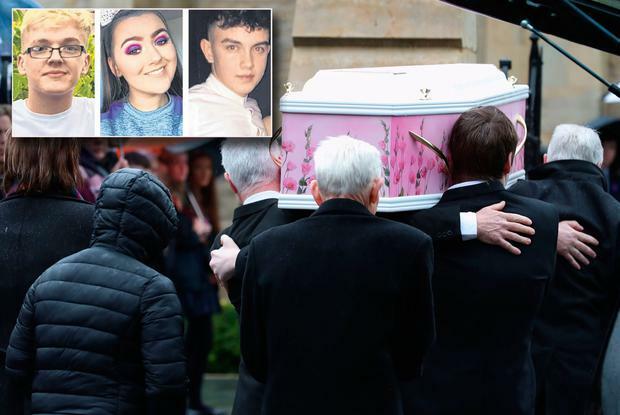 In his homily, Father Aidan McCann said that Morgan was "vivacious, charismatic and energetic young man who nobody had a bad word to say about". "Morgan was a person of character who had a great sense of humour with an abundance of wit; always a smile on his face. You could never pass him on the corridor in school and no doubt anywhere else without getting a warm look or a quick joke as he passed. "Morgan had a strong personality and didn't care too much about the opinion of others revealed in his various hair styles or indeed lack of hair, hair colours and his flamboyant choice of shirts. He was constantly breaking his glasses and his mother was constantly having to buy him new school shoes as he wore them out playing football. He was also a humble young man who would always listen and be there for somebody if they needed him." "In the face of this great suffering and sorrow that is felt by us all at this difficult time many people can find it hard to believe and it can put their faith to the test. Why does God allow this? We must remember that God is not far removed from us in our sufferings and sorrows. "We the priests of the parish extend our prayers, care and deepest sympathies to you, Maria and Jimmy, at this terrible time as well as to Morgan’s siblings Calvin, Robyn, Regan and Elyssa. And of course, with a new baby expected this year; who will know his or her brother by the stories of love they will hear about him." A funeral service for Lauren Bullock (17) is also taking place on Friday morning, at St Patrick's Church in Donaghmore. Father David Moore said that the parish of Donaghmore will forever remember St Patrick's Day "as the awful day when three beautiful young people, all in the prime of their lives, were overpowered, literally in the mad rush of our modern world and needlessly lost their lives". "On Sunday night, and during the early hours of Monday, a dark and threatening cloud hung over all of us, as we struggled to understand and come to terms with the tragic turn of events on what ought to have been a night of fun, dance, friendship and laughter. "Instead we learned, in a state of shock and disbelief, of the news of Lauren’s tragic death, and the deaths of Connor and Morgan. The very large gathering here today is to honour and respect the life of Lauren, so sadly cut short, and to support you Mary, Martin, Shane and Ryan. We can only but imagine how you are feeling today. Everything was ok on Sunday and one phone call to you, changed your lives in an instant and we are all too aware that life will not be the same again for any of you without Lauren. We never know what each new day will have in store for any of us." Fr Moore said that Lauren was a "wonderful and caring daughter and friend". "Aged only 17, Lauren was well in the process of making her mark on her home, her school, this community, her circle of friends. She was ‘living the dream’, energetic and full of life, doing and enjoying all the things that made her happy. She was a girl who was happiest when she was doing things to help others and gave of herself and her time to do a good deed whenever and wherever she could. 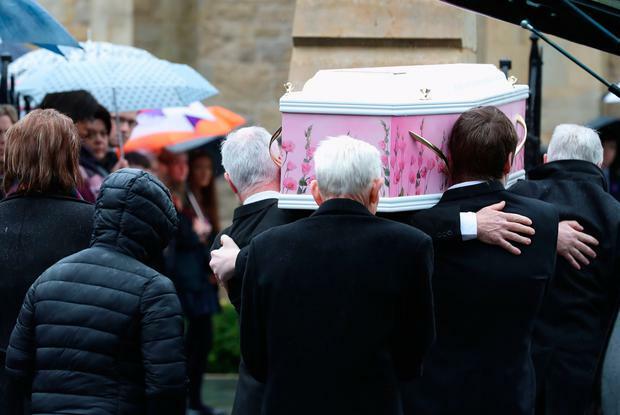 "Lauren’s many friends have described her to me as having ‘a warm and bubbly personality with a very infectious smile’, that’s a lovely picture for all of us to have of her in our minds today." He added that Lauren had "a positive outlook on life and a real zest for living". "Lauren loved people as much as they loved her and was a real ‘socialite’ with lots of friends and people who admired and looked up to her. Lauren was involved in football and the scouts. She had started her driving lessons and had taken to it like the preverbal ‘duck to water’." "Lauren has had too short a time on this earth, but for her 17 years of life she has certainly achieved a lot, she used her time well and wisely. "When tragedy strikes, there is a numbness that comes with it. We don’t want to think too far ahead and we cannot imagine life without her warmth and presence. Since the early hours of Monday morning, there has been a wealth of support and care for the family from the entire Donaghmore community and further afield. 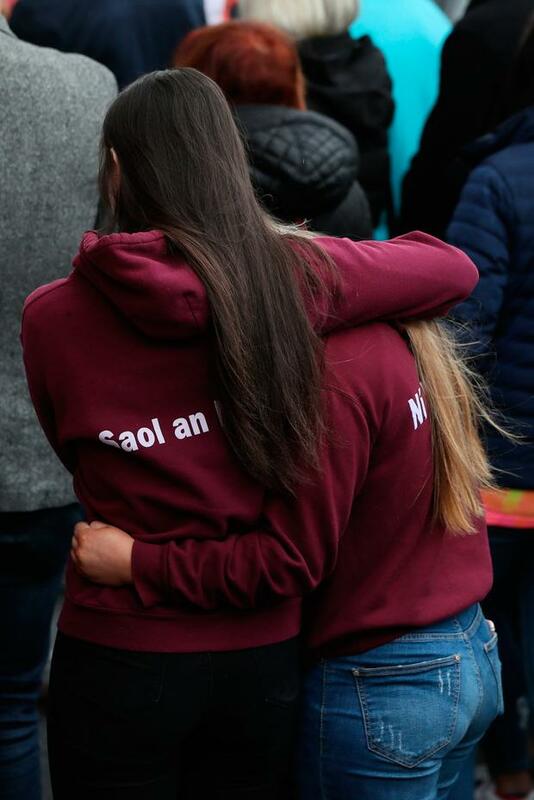 I commend our schools in the locality for all that they have done in ensuring the well-being of all our students as they come to terms with the deaths of Lauren, Connor and Morgan. "Mary and Martin, when you brought Lauren to be baptised, some 17 years ago, your hopes and dreams for her were very different to what we are experiencing today. For your little family, this is one of the hardest journeys of your life. Today is not what you ever believed could happen and Saint Paul reminds us that life is changed, not ended. Amid your pain you have conducted yourselves with great dignity and decorum, welcoming so many people into your home to offer you their heartfelt sympathy. Know that you have the love and support of the entire community. We will all be here for you." The funeral of Connor Currie, 16, was also held in St Malachy's Church, Edendork today at 2pm. 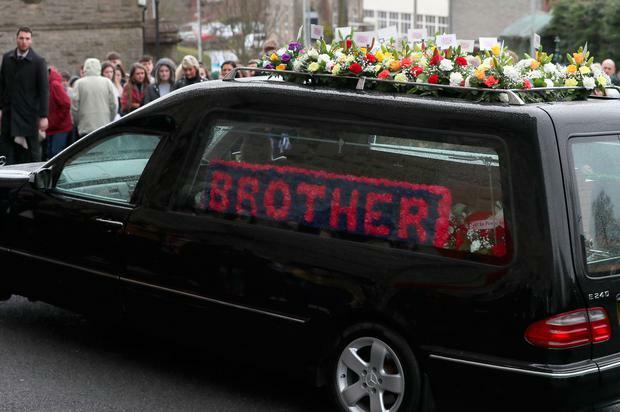 Father Kevin Donaghy told mourners that Connor had a "remarkable capacity to look after his younger brothers Sean, Cormac and Cahir: so much so that he could be left to look after them and even prepare food for them when their parents went shopping or on some short trip". "In recent days Connor’s parents and close family have been greatly comforted by the good memories shared with them by Connor’s classmates and team-mates and teachers and friends. "Friends have recalled how he lit up a room as he entered it and his infectious smile warmed everyone’s hearts." At his funeral mass, Connor was remembered as a "courteous and appreciative young student" and had dreams to be an accountant. "He was a star on the football field as well - the trophy brought up at the start of the Mass just one token of the commitment and skills he was developing. "And there’s always bits of a teenager’s life that the parents don’t get to see, so it has only been in the last few days that Connor’s friends shared with his parents some video shots on their phones of Connor practising his dance moves – and improving those skills as well. "For us, of course, he is gone all-too-soon, but we listen to the promise of Jesus in the gospel that He goes ahead of his faithful people to prepare a place in the everlasting peace of heaven. God opens His arms in welcome to Connor. May his kind soul find eternal rest in the happiness of our eternal home."